First, trigger warnings for suicide & abuse. This is a novel that deals heavily in those issues, and does so remarkably well. If you've heard of Matthew Quick, it's likely as the author of "The Silver Linings Playbook," so you know he does a good job creating realistic, relatable characters coping with mental illness and therapy-inducing traumatic life events. Basic set-up: Leonard has decided he's going to kill himself and Asher Beal on his 18th birthday, but first he wants to give a gift to each of his four friends - a Bogart enthusiast, a Persian violin-prodigy, a home-schooled evangelical, and his teacher Herr Silverman. This novel initially had me struggling to overcome my own assumptions and predispositions. It took me several chapters to begin to empathize with Leonard because, frankly, he's just so angry at everyone around him. Noah Galvin's narration captures a snide, angry adolescent so well that the character really grated on me as I got into the first-person narration. As Leonard continues to relate his story, he includes flashbacks to how he met each of his four friends. He begins to make sense, both as a justifiably angry character, as you learn what has pushed him to the brink, and in his judgments of those around him. When he belittles his peers as sheep, mindlessly finding him strange and hating him for it, I realized I was doing the same thing as those peers. Sure, following strangers around cities (one of his pastimes) isn't ideal behavior, but his reasons are heartfelt and benign. He doesn't have strong role models, nor enough positive peer influences, to direct his curiosity into more productive channels. It's hardly entirely his fault he's ended up so bitter and destructive at 18. Galvin's audio narration captures Leonard perfectly. He's predominantly cutting and derisive, but occasionally a spark of of fear or concern breaks through. Galvin's tone shifts for these few sentences, and you believe his performance as a teenager who, while harboring deep-seated anger, is also scared and lonely. The audio narration enabled me to see beyond Leonard's anger and stick with his story to find out what motivated his utter loathing for most other people, which in turn re-shaped my opinion and understanding of him as a character. Verdict: Affirmed. If you can stick with the novel through the opening burst of anger, it's well worth your read, and Leonard is well worth your empathy. Thanks SYNC for another great pick! 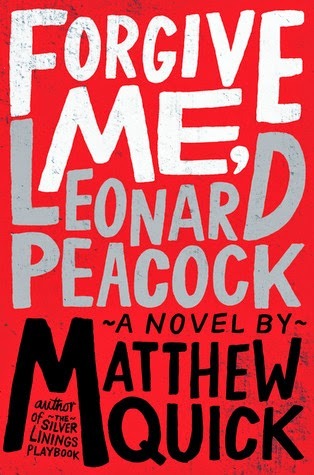 "Forgive Me, Leonard Peacock" by Matthew Quick, published by Little, Brown Books for Young Readers on August 13, 2013. Audio narrated by Noah Galvin, published by Hachette Audio on August 13, 2013.